Server-based computing will greatly simplify the application infrastructure of your business if you have 5 staff or more. Every user can talk to the file server, but they cannot talk to one another. 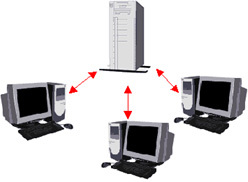 Some common server types include file servers, mail servers, print servers, fax servers, and application servers.